Mixed Bag of Rant: I'm a Get Lucky 7K Finisher! I'm a Get Lucky 7K Finisher! Firstly, before I start my rant, let me say (scream) out loud that I AM A 7K FINISHER!! For the seasoned runner, I imagine you chuckling at my excitement over a mere 4 mile race. However, I am crazy proud of this accomplishment- it is the furthest I have ever run in a competition setting. I started officially training for this race at the end of December using the 5K to 10K Active.com training app. Being a 10K training program, I thought it might push me to work harder and finish faster at this race. I hadn't forgotten how different it is going from treadmill to the road. Brutally different. However, I still wanted to finish in 45 minutes or under. If you are anywhere in or near Minnesota you know that this winter has been absolutely horrible. Between the snow and bitterly cold temps, it has been nearly impossible to train outdoors. Mid-March. Just a few days from officially being spring. I didn't think it would feel like JANUARY this past Saturday! The temps were bitter and as runners we were immensely inappropriately dressed for 18 degrees. The Get Lucky 7K is officially one of the largest timed road races in the state with over 9,700 finishing the race and the thing you forget about is that trying to get 9,700+ runners through the start means a whole lot of wait time if you are anything slower than a 9 minute mile. We waited in the corral for 45 freaking minutes before we finally made it to the start. By that time, I couldn't feel my toes, hands and my thighs had started to feel numb as well. Our Lucky's crew (our sponsor) stuck it out together for about the first mile or so before we started to disband. My dear friend Kathy and I stuck out the whole brutal race together. When I say brutal, I don't mean just cold. It was icy, slushy, wet and hilly. We walked up the two main hills but ran the rest of the way and finished with a time of approximately 49 minutes for the 4.34 mile run, putting our pace at right around 11 minutes/mile. I have been disappointed about my finish time, but the more I think about it, the more I was probably right on pace with what I wanted given the horrific conditions on race day. I usually don't run with anyone as I have found it to be a distraction in the past, but I was beyond happy that Kathy and I stuck it out together. We were able to support each other and push each other. Her pace is much faster than mine (she's also got about 4+ inches in height on me) which helps me to push harder and go faster. I'm so, so grateful to have ran this race with her. I'm still working on my husband to participate in the Minneapolis Duathlon as a relay team- I would take the 2 5K legs (unless we can find another willing participant) and he would take the 15 mile ride. His biggest concern? That he couldn't wear headphones. BOO!! That's no excuse!! I'm going to work on this one! I mean... I love having all the glory... but I think he would really have fun doing this! All of this training and competition is in hopeful preparation of the pinnacle of all of our 2013 hard work... Our running crew is looking to run in the Disney Princess Half Marathon in February 2014. 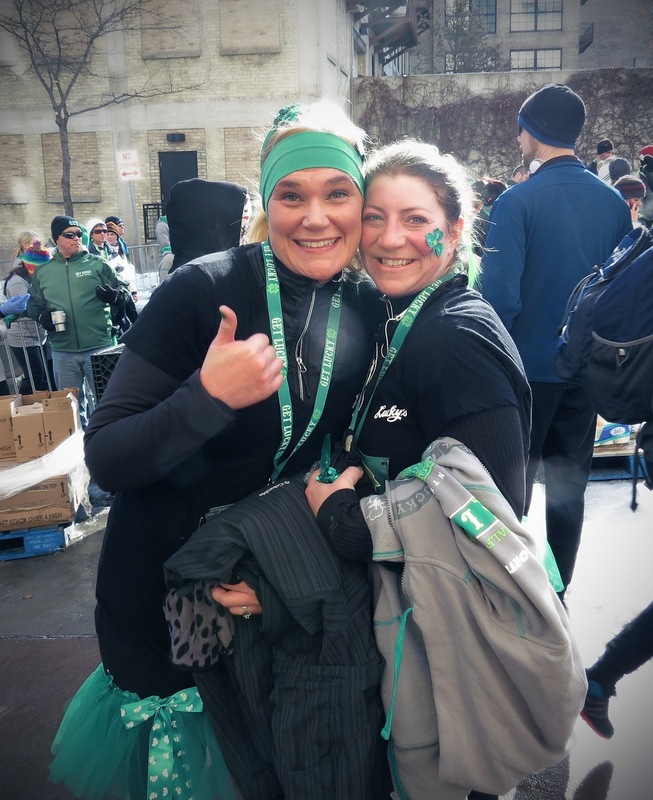 If you are in the Twin Cities and looking for a crew of supportive, fun women to run at events with please let me know! Our current crew is at varying levels and paces so there is truly no runner left behind and we will wait for you at the finish. Be warned. We are a good time. We drink beer following our races. We have potty mouths. We laugh a lot. We wear ridiculous costumes. Basically, I couldn't have fallen into a better group of women to team up with- I know you will love them too! Fab Fit Friday: 30 Day Shred Completed!